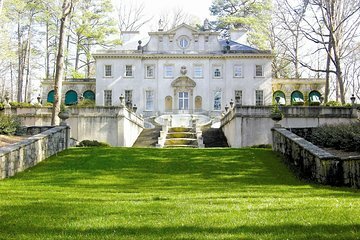 Vous en apprendrez plus sur l'histoire d'Atlanta, Géorgie à travers l'architecture lors de cette excursion de 4 heures des maisons historiques. Visitez les trois maisons qui s'étendent d'une maison de plantation traditionnelle de 1840 avec des interprètes costumés jusqu'à la maison élégante Swan House de 1928, et vous en apprendrez plus sur chaque site auprès de votre guide sur le chemin. Toutes les visites se font à l’extérieur de Swan House et s’arrêtent pour le déjeuner (à vos frais) à la Swan Coach House. Shelly, our tour guide, was absolutely amazing. Best tour ever!!!!! On a scale of 1-10 she was a 100. Shelly was the best tout guide in Atlanta! Our tour operator was Great Exploration Tours and they were fantastic! Lots of personal touches and a great tour four a very thorough Atlanta experience. The tour was exceptional. Our guide Shelly was awesome and so knowledgeable. We enjoyed her narration and the information she provided. Will be happy to refer others! We had terrible weather. But if a bummer. Margaret Mitchell house is very interesting, worth the visit. Swan house, wasn't guided... wish it was. No tine inside actual museum. You need to book it on your own. Had a great time. Our tour guide was excellent and even dropped us at a recommended restaurant at the end of the tour. Would definitely recommend. A good tour to take if you only have a 1/2 day and want to see some of the historical sights in Atlanta. It definitely will give you a good taste of Atlanta's history. Our tour guide was great, efficient and helpful. I would book a similar tour elsewhere again. Thank you. The tour was great. We had a rough time getting started as our driver was 1 hour late to pick us up.